A “Genius Hour.” “20% Time.” “An Hour of Code.” These ideas suggest that students should be allotted time during the school week to follow their own interests. But it this really a substantive or sustainable change? Indeed, when Google went public in 2004, co-founders Larry Page and Sergey Brin argued in their “Founders’ IPO Letter” that 20% time was key to the company’s employees being “more creative and innovative.” Many of Google’s "significant advances,” including AdSense, Google News, Gmail, Google Talk, and Google Reader, were developed in this way. Recently, this notion of “20% time” has become a popular policy in schools as well. The idea appeals, in part no doubt, because of the hope of spurring that very Google-y sort of creativity and innovation in schools. It’s also an attempt to recognize and make time for student-centered learning. Interestingly, many of the top search engine results for the phrase ”20% time" return examples from schools, rather than from Google itself. Here’s how Google has effectively shut down 20% time without actually ending the program, says our source: First, as has been reported previously, Google began to require that engineers get approval from management to take 20% time in order to work on independent projects, a marked departure from the company’s previous policy of making 20% time a right of all Googlers. There are many lessons to be learned from Google here for schools. Most obviously: if the metrics that matter to those in charge don’t “count” what happens during “20% time,” then “20% time” is easy to scrap. It’s easy to skip. It’s easy to dismiss. It is, after all, only one-fifth of the week. But many schools have really seized upon the idea that one-fifth of the week dedicated to student projects makes a difference. 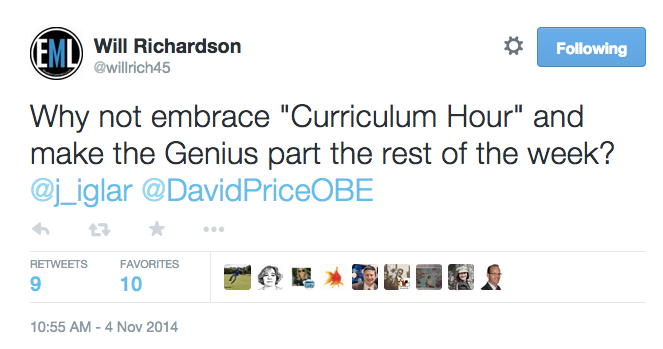 Or even less than one day, we’re seeing calls for an hour: “A Genius Hour.” “An Hour of Code.” An hour. Is that hour really that subversive? What does it mean that schools are applauded when students are sanctioned — for one hour — to follow their passions? What message does that send them about the rest of their day and week at school? Does an hour even count as incremental change? Are these efforts transformative? And are they sustainable? Will these hours or days remain in place? Or will they face the same fate of Google’s policy, and be quickly set aside when schools’ goals trump students’ interests?